It's reached that point in the year when the cold weather is still here but spring fever has kicked in big time. And in no other industry is that more apparent than beauty. All the spring beauty collections are in stores now, and I begin to gravitate towards lighter more pastel shades to bring me out of my winter makeup coma. I'm not a huge fan of pastel shades on the lids, but on the cheeks - YES! Though let's be honest, these blush shades are perfect for all year round but that doesn't stop me from putting them in the category of "here's my new spring makeup that looks oddly similar to my winter makeup but it makes me feel better to say it's all for spring." 1. Lorac Buildable Blushes in Prism and Spectra - For those who want just a hint of color on the cheeks and a foolproof application, these Lorac blushes are for you. The texture is incredibly smooth because the powder is so finely milled and they dust just a hint of color on the cheeks with one swipe. But as the name implies, these can be built up for a more intense payoff. I would normally reach immediately for Prism, but Spectra has been the winner for me these past few weeks since it gives a nice rosy flush to the cheeks. There are a ton of shades in this line that range from subtle neutrals, to a vibrant violet and deep burgundys/matte browns. So while the two colors I have are perfect for spring, there is a shade in this line for every single season. 2. 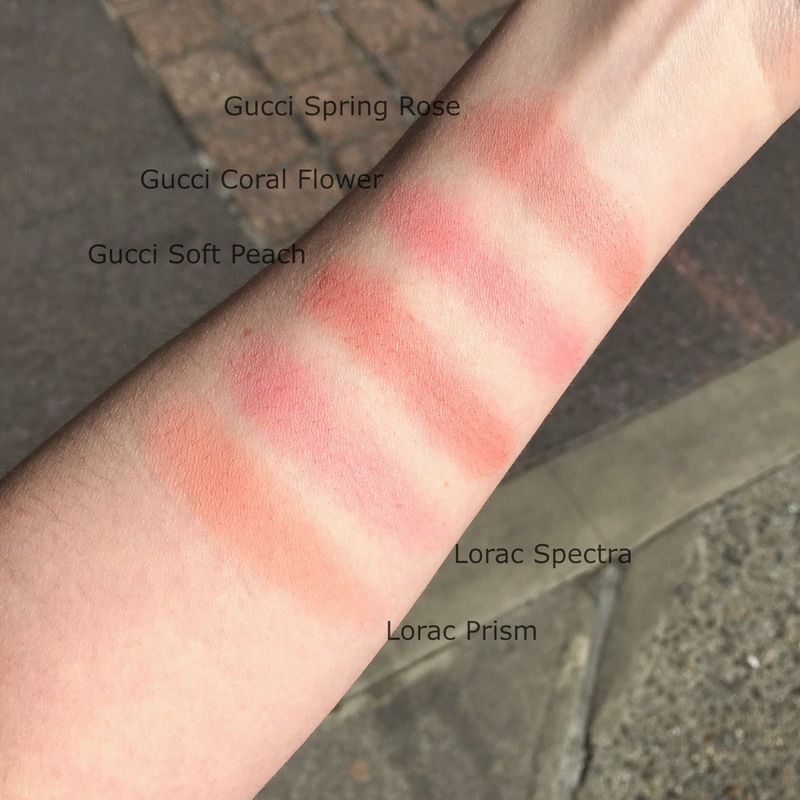 Gucci Sheer Blushing Powders in Soft Peach, Coral Flower and Spring Rose - If you are a regular reader of my blog (hey guys *insert hand wave emoji*), then you know that Gucci solo shadows are my favorite powder eye shadow formula of all time. Big statement I know, but I truly love them (read my review here). I had not tried any other powder products from Gucci, though the blush shades in the range looked too good to pass up. They all tend to steer towards the neutral end of the spectrum, though there are some deep plums and raspberries in the line as well. The formulation is much denser than Lorac and has a stronger payoff from first swipe. But though they pack a good punch on the cheeks, they are easy to blend and apply evenly with no patchiness. The three shades I have are all in the warm peachy/rose family with only slight variations between each, and all work well with my standard makeup looks. #teamneutrals. If you are new to the Gucci line, I highly recommend trying these out along with the solo shadows if you can't stop at just one product. No judgement here. I noticed that Gucci or Givenchy makeup is not talked a lot, they look promising enough for me, not to mention pretty! Thank you for sharing. 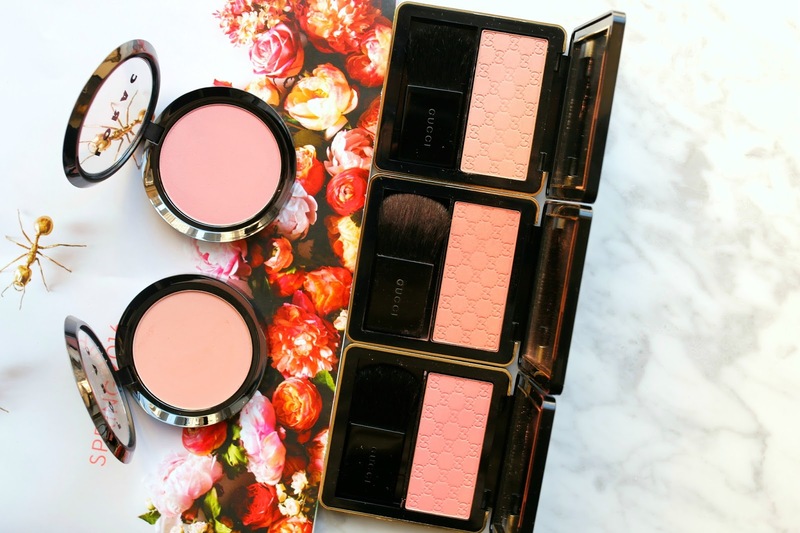 The Gucci blushes look incredible! I think I need a couple to get me excited about the upcoming warmer months! Love!! These are very very pretty for Spring.I love pastels blushes, too.